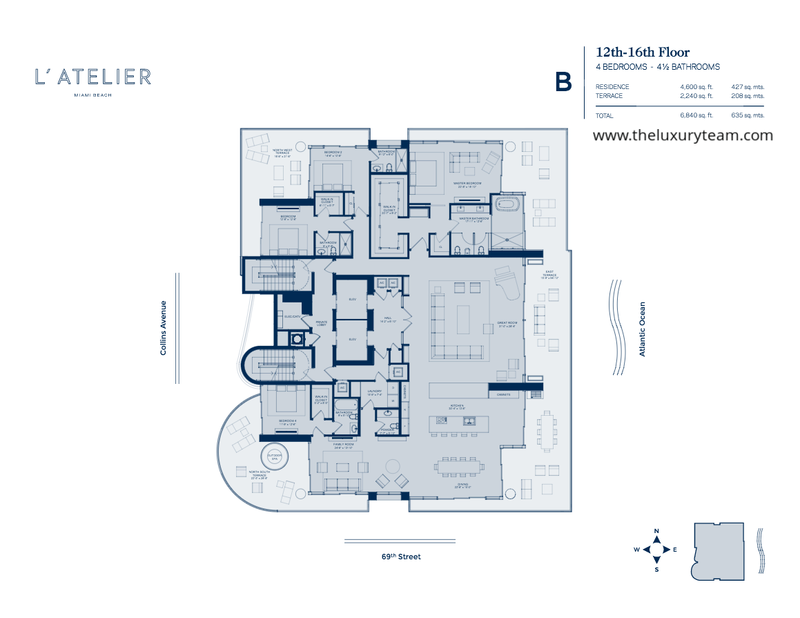 L’ Atelier is a stunning tower of 18 floors located in beautiful Miami Beach. What once was the Golden Sands Hotel is now this gorgeous set of 20 units by the SMG Management and W Capital Group. Located at 6901 Collins Avenue, the units are available in 3 and 4 bedroom floor plans. They range in square footage from 2300 to 4600 square feet, with 6 bedroom penthouses available with up to 8500 square feet of space. Prices of the residences range from $4.8 million to $9.2 million, depending on the choice of style and space. The units are available with the choice of using up half of one floor, an entire floor, or a penthouse design. Each unit also has a gorgeous private and expansive balcony, with panoramic ocean and city views as well as an outdoor whirlpool spa in each. The state of the art Poliform kitchens come equipped with gorgeous and modern Gaggenau appliances. Each residence boasts ceilings of at least 10 feet in height to promise an open and free feeling living space. The property of L’ Atelier boasts a private beach area, as well as beach and pool attendants. The ocean front infinity edged swimming pool is accompanied by a 78 foot lap pool, for the residents to choose between fitness or relaxation (or both). The pool area also has private cabanas and a pool bar with a BBQ area available for use. Along with a Whirlpool spa, there are also sauna and steam rooms, a hammock garden, and a beauty salon, promising the luxurious nature that residents are looking for. The 24 hour valet and concierge services also provide the promise of ease of living. With a state of the art gym, library, and meeting room, this property is perfect for those who enjoy work and play. 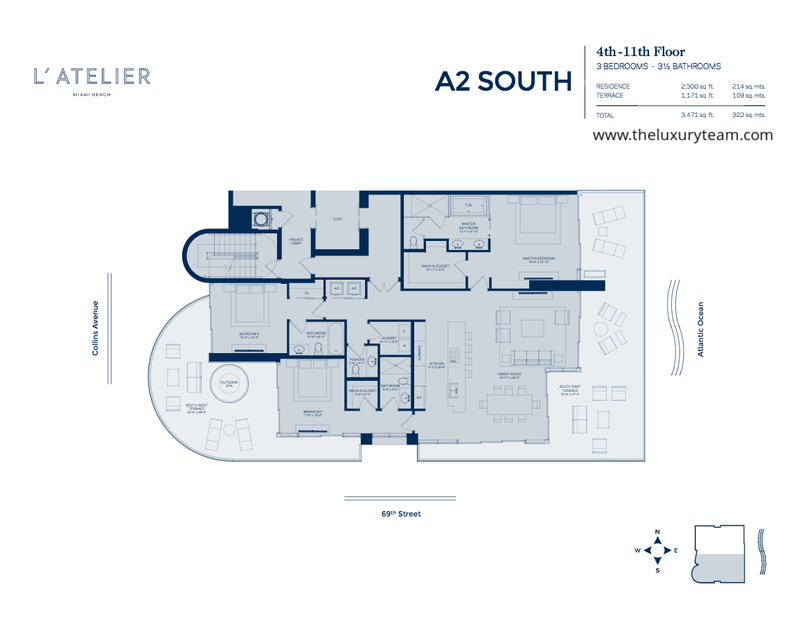 L’ Atelier is located near many coffee shops, retail options, and entertainment venues. There are also numerous tennis courts, golf courses, and country clubs in the area, further adding to the exclusive and luxurious nature of the property. Ocean Drive and Lincoln Road are just a very short distance away, and will continue to provide entertainment, schools, and daycares in the area as well. Just across Biscayne Bay is the wonderful downtown area of Miami Beach, promising all the wonders of bustle and nightlife the area has to offer. These units are sure to fill up quickly in L’ Atelier. 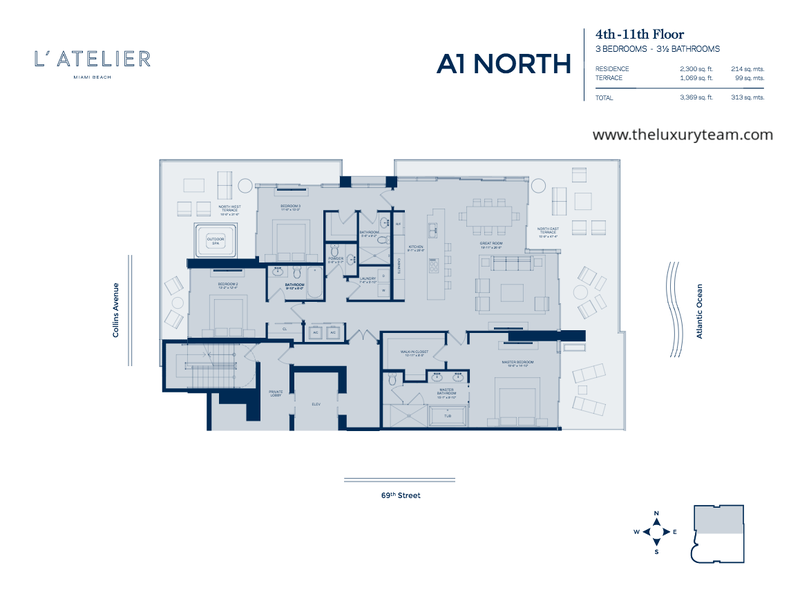 It’s vital to express interest as soon as possible to ensure that you hold a spot in the exclusive and luxurious residences of L’ Atelier.